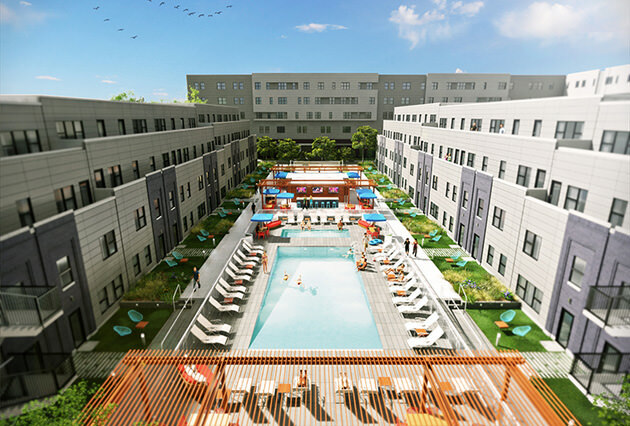 West Quad, a new mixed-use student residence complex, has broken ground in Champaign, Illinois, near the campus of the University of Illinois. The site is located at 30 E. John Street, within close proximity to the Quad and Green Street’s dining and entertainment offerings. Developed by CA Student Living and designed by HPA, the project is comprised of two living components. An L-shaped mid-rise features two- and four-bedroom units atop a two-story parking base with ground-level retail. Alongside the tower are townhome-style residential units with duplex configurations. Amenities include a fitness center, club room, theater, and a sundeck with a pool, lounge seating and a sand volleyball court. The modern design aesthetic is underscored by clean architectural lines and contemporary masonry. The project is scheduled to open in Fall 2015.